I didn't bring any art supplies with me to Japan as I knew there wouldn't be much art time. I did bring some pens and a little notebook, but other than jotting down some observations, I never did do any doodling. At home I keep a daily drawing journal which is actually a calendar with full pages for each day. Nothing got filled in while I was gone so that left a lot of blank pages when I got home. Rather than doing a lot of drawing, I made a couple of collage pages to fill them in, as leaving blank pages just bugged me. Try It On Tuesday has a new theme which is Destinations. Perfect for my pages! And because I have a bunny and some flowers on these pages, I am also linking up to Jo's challenge at Art Journal Journey Her fun theme is Flora and Fauna. And finally, Moo Mania has a "new" theme which is more flowers, and both pages have flowers so they fit for that challenge too. I adore your pages Erika-- specially LOVE LOVE LOVE the bits of papers from Asia . It is super to collage when it calls you. I also do always the thing that is nearest to my heart. We are artists! Our muses are often inconsistent but that is a big benefit. People always doing the same get always just the same and can't find out new things...and that is boring - but we are adventurers! 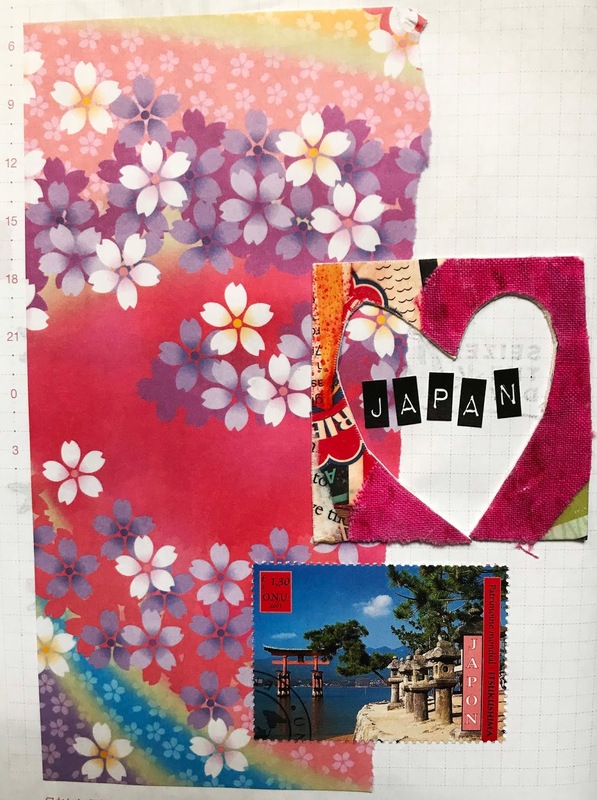 You just made me happy with linking this two fabulous Japan inspired pages to Art Journal Journey, Moo Mania & More and Try It On Tuesday! You always support our challenges so well! Thank you from the bottom of my heart dear Erika! Weekend is near for you - hope your weather is better than ours here. It got cold again and rains cats and dogs the whole day! Indoor - houscleaning or better ART time for me! I love the collages especially the bunny page. So nice that your collages fit multiple themes. Enjoy the sunshine. Looks like we're going to be wet for most of the day. I know just how you feel with travelling and crafting - sometimes there just isn't the time or the will. 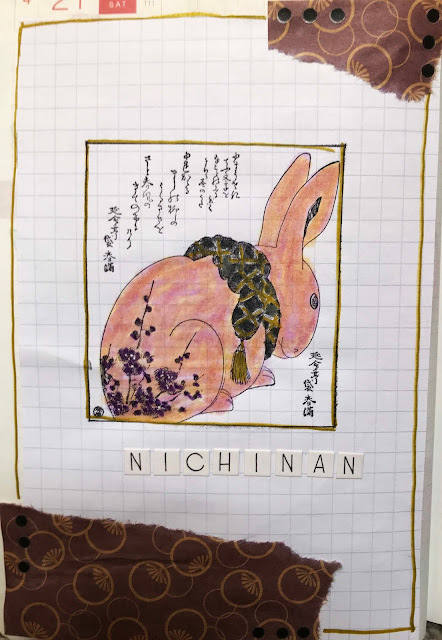 I love your collaged catch up pages though, especially the little rabbit - he's wonderful. I hoped you would share some of your Japan pages with us at TioT's Erika. These are are fantastic collages and the rabbit looks so cute. I really liked your pretty papers and picture as well was it a postage stamp?. I love the bunny stamp. It is fabulous with the sentiment (I hope) as part of the stamp. I'm really enjoying these Japanese pages. Like you, I don't like empty pages or even squares in my calendar. I'm sure it won't be long until you have exactly what you want on each page. Until such time, I appreciate you sharing these latest beauties with us at Art Journal Journey. Both pages are beautiful Erika! I love the compositions. Two super collage pages, I really like both, the rabbit looks great, I actually thought he was hand drawn by you at first, the colours on the second one really sing to me, such balance too! Wonderful and a fantastic way to fill those empty pages! I like both your pages -- especially the bunny post! I'm debating on taking supplies too. There's never time yet sometimes you really want to draw! Fabulous pages Erika, just love that bunny, and the collage page with it's gorgeous colours is lovely.